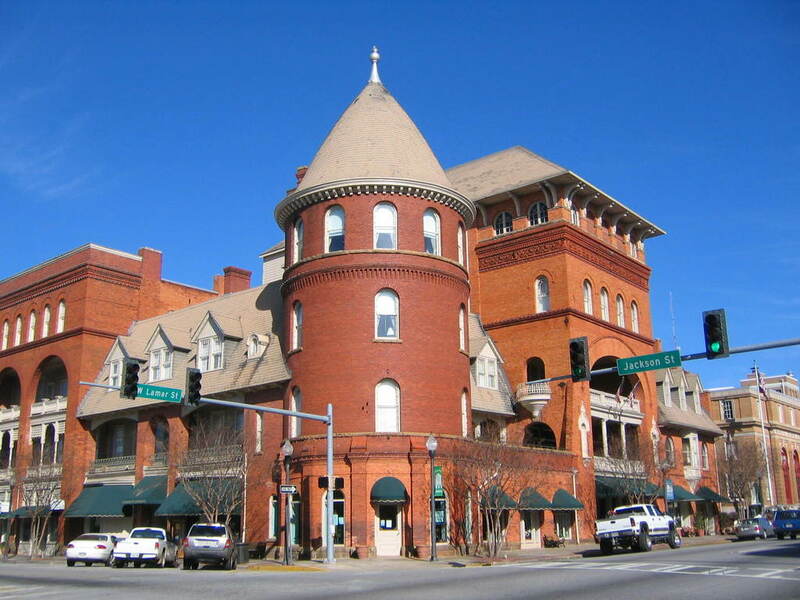 Built in 1892 to attract winter visitors from the north, the Windsor Hotel is a Victorian masterpiece designed with a tower and turret, balconies, and a three story atrium lobby. Americus, Georgia, (population 17,103) was incorporated in 1832 as the seat of Sumter County. The area along the banks of the Flint River had first been settled by the Creek Confederacy Chehaws, who established the location as a key trade center. Railroads first came through Americus in 1854, spurring its growth. Even during the tumultuous years of the Civil War in the 1860s, Americus flourished because of its cotton production and distance from the front lines. From the late 19th through the early 20th centuries, Americus continued to thrive, epitomizing the opulence of the Victorian Age through the architectural styling of its commercial buildings and residences. Agriculture remained its chief economic engine until the boll weevil devastation and the Great Depression, after which peanut farming was introduced to the region as a way to restore land productivity. Agriculture still reigns in Americus, but education, business, and industry all contribute to the most diverse economy in the city’s history. Designated a Georgia Main Street City in 1983, Americus maintains the vibrancy of the central business district through an ongoing revitalization program. Walking and driving tours explore the historic downtown and charming neighborhoods of Victorian, Classical, and Antebellum homes shaded by ancient oaks and dogwoods. Since 2002, the SAM Shortline Excursion Train has brought tourists into Americus and other towns in Southwest Georgia. Highlights for visitors include the restored 1892 Windsor Hotel, the Habitat for Humanity Global Village Museum, the restored early 20th century Rylander Theater, and the city’s downtown collection of Victorian commercial buildings. Another local attraction is Oak Grove (c. 1856), Georgia’s oldest active cemetery. Tourists and residents can stroll through the symmetrical landscape and view the cemetery’s Victorian sculptures and stones with Gothic funerary motifs. Each year Americus hosts the day-long Georgia Pecan Festival. An annual “Arts in the Park” celebration is held in Rees Park, created in the late 1800s to honor a Confederate soldier. A 1910 two-story Neo-classical school building in the park has been rehabilitated for use as the Rees Park Economic Development Center.